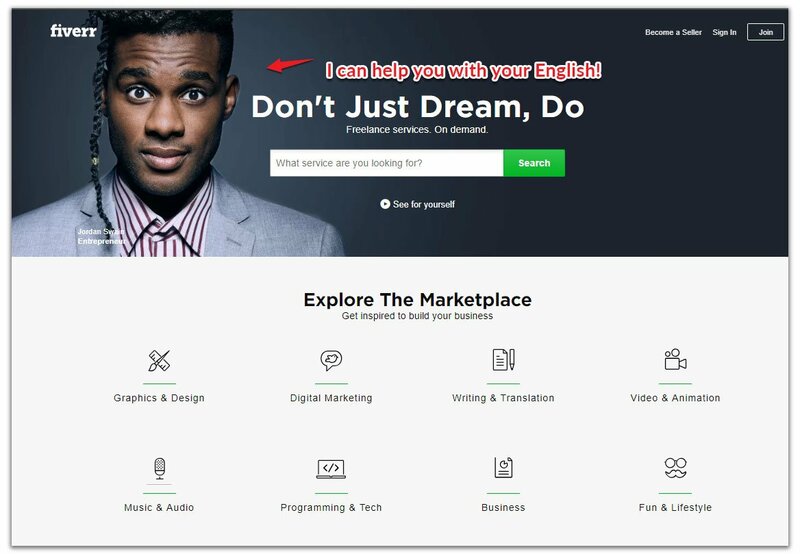 Do you want to make money blogging and are wondering whether you should write in your own language or try blogging in English? You are a non-native English speaker, perhaps it’s your second or third language. You don’t feel confident you can do a good job writing other than in your own mother tongue. You also understand that English is the only available ticket to a global readership. As a non-native English speaker myself who have been producing English content, I can share some tips which hopefully will answer your dilemma should you decide to blog in English (or not). You will learn how blogging in English could attract more international traffic and possibly make you more money. But there are a few things you should be aware of and challenges you may need to overcome. This blog post is a little long but I promise you’ll learn a lot from it. 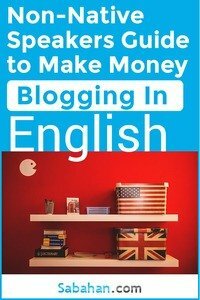 Is English the Best Language for Your Money Making Blog? Why Should You Blog In Your Own Native Language? Should You Create Two Separate Blogs In Different Languages? Should You Blog In English Even With A Poor Command of English? Do You Need A Good English to Create A Good Blog? Should You Use The American or British English? According to the Internet World Stats, the English speaking Internet users only account for 25% of all the Internet users. Chinese speaking Internet users are the second largest group. This is not surprising considering China is the most populous country in the world. W3 Techs says that about 52% of websites are in English. The other half consists of non-English websites in various languages. So it’s clear that English is the language of the Internet. It is also the lingua franca of academic and scientific discourse. Therefore it makes more sense to write your blog in English rather than in your native tongue if you want more visitors right? But before you start a blog in English and get too far down the road, there are a few things you need to consider. If you just want to write about your experiences and opinions on certain issues and want to attract a certain audience, consider what their primary language is and write in that language. If you have a local business, you’d want the locals to notice the business so you need to write in their primary language. Getting traction locally will be easier if you choose to blog in your own native language. The traffic might be slightly lower, but it may be more engaged and lead to opportunities in a local market. You may get invited to speaking presentations, coaching even book deal. This article focuses on making money from your blog so if this your primary goal, then I will explain the pro and cons when writing in English for non-speakers. I also assume you expect to get most of your traffic from Google organic search. The big companies like Salesforce generated most of its revenue from the US. The second country that made them the most money is Japan which is a non-English speaking country. If you look at the make money blogging and Internet marketing landscape, people are focusing on the US market or any English-speaking countries because there is a lot of money to be made there. For countries like Brazil, the Middle-East, Russia, South Americas (even some countries in the Asia-Pacific) the currency exchange rates may not be favourable so targeting these regions won’t make you as much money. 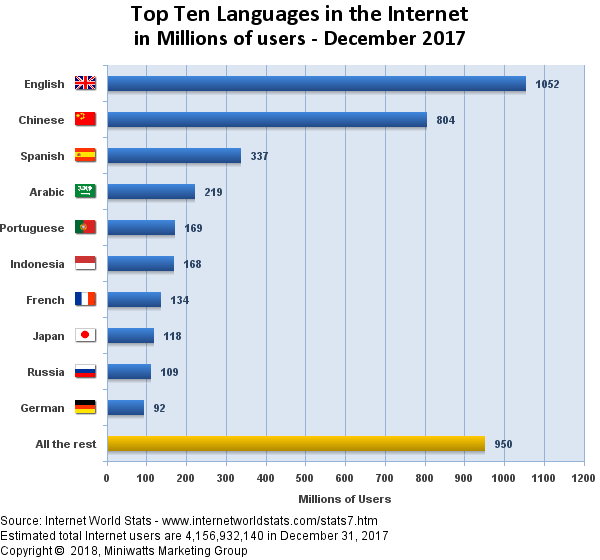 However, if you are already a native speaker from any of these countries you should consider blogging in your own native language. Because there’s very little to no competition in these regions. As the world is becoming more globalised, new markets are opening up. Going after these regions give you the first-mover advantage. If you are already living in these regions you have a better understanding of what content you need to create that is currently lacking. In the US, the term “car insurance” would cost up to US86.11 per click on Google AdWords as shown by Google Keyword Planner. Keyword Planner is a free keyword research tool that comes with AdWords. If you look at the top 10 organic search results on Google US, there is no way you and I can compete with those guys (duh!). They are highly experienced in their craft and have the money to outrank anyone. Now search again for the term but in your own native language. Even though it may say the term is competitive, you’ll still have a better chance of competing with these guys than those from the US. Depending on your language, Google and all these social media sites don’t have enough content in the local languages in those niches. There’s a large knowledge gap you can fill by creating blogs in your native language. If you create content for these regions, it’s much easier to get social shares and good Google rankings allowing to dominate your niche. Although getting social shares and engagement differ from country to country. For example, the Spanish speakers engage a lot in social media, while the Germans social media usage is significantly lower but increasing. You may not be making much today but you are going to grow faster because you have less competition. In the long run, there will be more people in those regions getting online and this helps you grow your blog traffic even quicker. In general, starting a blog in your best language is a good idea because it can give you more confidence as you build your blog audience. You could fine tune your sentence and use playful words in your own mother tongue. You could write faster too. When building your own mailing list, you are writing in your audience native language. As a result, you’ll likely see a high open rate and click-thru rate on your emails. Writing a blog in your own mother tongue is good because of the growth potential and future opportunities. But I also understand bloggers want to make money now, not sometime in the future when our regions have caught up with the US and other English speaking countries. So should you create two separate blogs, one in your own native language and one translated into English? Personally, I’d only look into creating a second blog only after having some success with the first blog. It takes a lot of effort to translate a blog into another language. You also need to think in terms of the work involved in optimising each blog for the search engines. Since your main source of traffic would come from organic Google search, for each language, you also have to perform keyword research, creating an optimal title and meta tags, build backlinks, sharing on separate social media accounts, commenting and so on. Two sites, two times the work. Also, your English-speaking audience is not interested in seeing tweets in other language and will most likely unfollow you. So you may also need two different social media accounts for Twitter, Facebook Google+ and so on. Too much work if you ask me. However, if you are up for the challenge, by all means, go for it. What keywords do your potential readers use to search for your blog? Do they use native keywords only or a combination of native and English keywords? Is there a standard native vocabulary that’s widely used in your niche? These are some of the SEO issues you have to consider. To help you answer these questions, you can use Google Trends to survey what your potential readers are searching for. Go to Google Trends and start typing the keywords you want to write about. Make sure to select the country you want to target. This will give your some additional keyword ideas to target. If your keyword doesn’t have data, try a different keyword. Some of these keywords are up-and-coming and currently trending upward or downward. May be you can do additional keyword research on top of it. It will also tell you what topic is hot right now. If you take those keywords and integrate them into your blog, you’ll start getting more traffic from Google News (assuming you are already in). You can start writing about the hot and buzz-worthy topic related to your niche. If you are one of a handful of local websites writing about the topic, you’ll likely appear on Google first page result and will get lots of traffic. You may be thinking of creating a multilingual or bilingual blog where you write posts in two or more languages to target more readers. Again there will be extra work involved. You need to manage the multilingual version of your site, learn how to target site content to a specific country and make sure you are not creating duplicate content. You may want to read Google multi-regional and multilingual sites guide. To learn how multi-language sites may affect your SEO, click here. I find most non-native English speakers are pretty forgiving when they encounter a badly written or less than a perfect blog post. It’s probably because they are also not aware if there’s anything wrong with the article. However, for native speakers, it’s definitely a turn-off. Writing in a foreign language is not an easy skill to acquire. While it can be done, learning is always a gradual process. The more you write the better you will become. However if your goal is to make money now from your English blog, and you are targeting the English speaking countries, you are just making it harder for yourself. If you write in broken English, your otherwise quality blog may look amateurish. You’ll get less engagement. People are less likely to subscribe to your newsletter. It may cause frustration and confusion which affect your website conversion rates. So, a broken-English set back is not what you need to begin with. Personally, I’m aware that my own English is far from perfect. Besides my less-than-stellar grammar, I sometimes struggle to express my idea in a way a native English speaker would. While the sentence did get my message across, I know there’s a better and more concise way to communicate the idea but I’m unsure how to improve it immediately. Coming up with a good blog post is hard, even more so if you are doing it in a foreign language. That said, you definitely do not need to have a perfect English to make money from your blog. 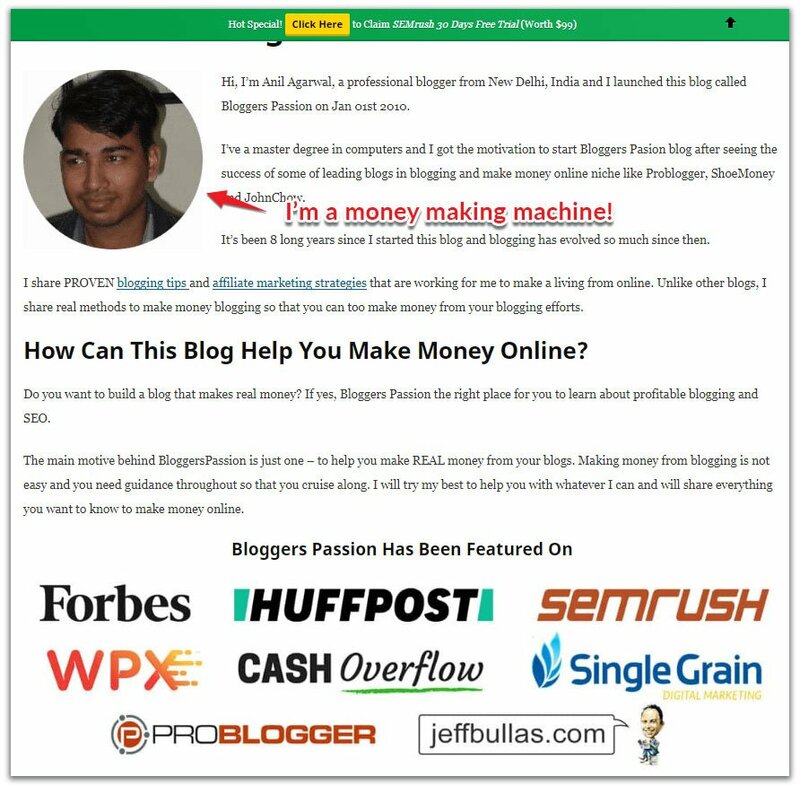 Case in point, Anil Agarwal, a professional blogger from New Delhi, India who blog at BloggersPassion.com. He primarily writes about blogging and SEO with the goal of helping other bloggers to get traffic and make money from their blog. Another thing to consider is the cultural and linguistic differences within the English language itself. I know some native-speakers may feel annoyed reading the American or British English when they are not from that region. There are differences in the vocabulary, spellings, collective nouns and others which can be another hurdle to overcome for non-native speakers in their writing. One can go on and on but I think you can just write in whichever English style you’re familiar with. For me, I want more traffic from the US, but I often write in British English rather than the American English because, in Malaysia, we are taught British English in schools. English is also a compulsory subject in all schools. However, I am more exposed to the American English on TV, movies and the Internet. I often ended up mixing both styles in my writing because I didn’t know which style belongs to which region except the obvious ones. Also the copywriting style I prefer using is mostly the American one that tends to overuse certain words like “great, awesome” etc while the UK is a bit more toned down. The days when you can write a 500 words or less article and still appear on the first page of Google search result are gone. In 2013, Google announced the Hummingbird update where they prefer pages with an in-depth answer to a question. 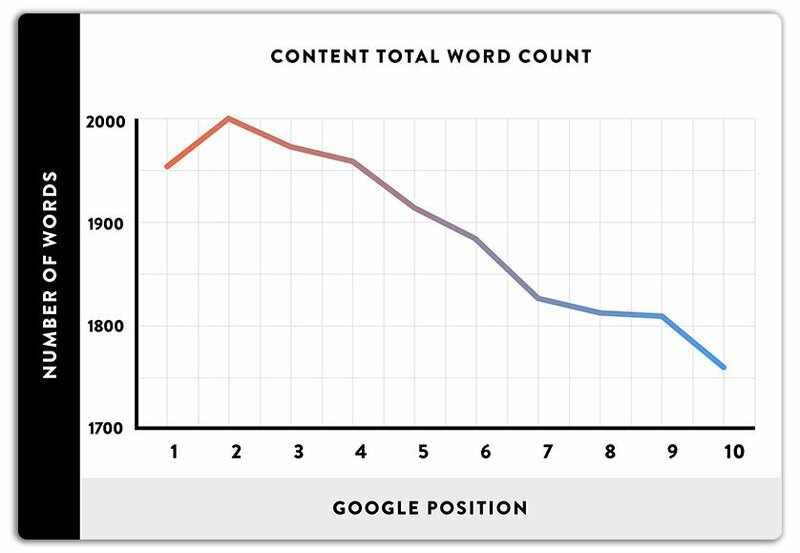 In fact, the average word count of a google first-page result is 1890 words according to some research. To have a better chance of ranking in Google, you need to write a very thorough and extremely helpful post that covers as many angles as you can for your topic. Do you have what it takes to write very comprehensive posts, day in day out, in a foreign language so that you’ll have a better chance of success in blogging? To make the process easier, you need to write something that you’re passionate about. Share your own value and expertise with others. If you do not have experience then you can take your readers on a journey as you learn. For instance, what I put up here at Sabahan.com is partly my learning experience. The blogging landscape is continuously evolving and you can’t be an expert in everything. As I learn, I feel excited to share my new thoughts and discoveries with my readers in each new posts. Also, check out my SEO tips for beginners to help you start off on the right foot. If you have an existing blog, you’ll learn things you can do right now to improve your blog SEO rankings. In order to attract the global traffic, you need to use a generic top-level domain, such as .com or org. If you use a country-specific domain such as .de or .co.uk, Google will associate your blog with that specific country. This is useful if your business serves a country-specific audience. 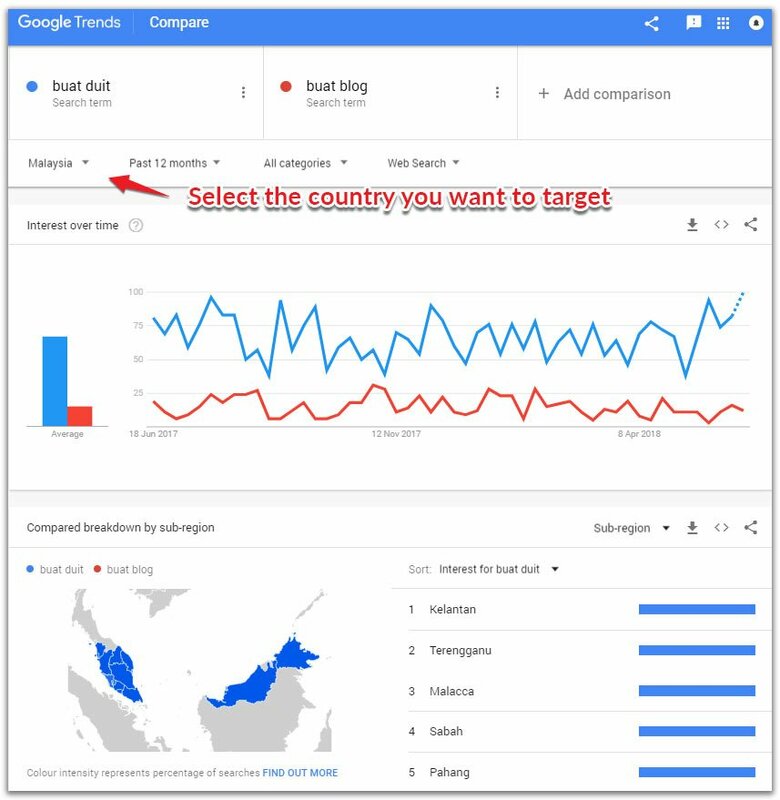 Now sign-in to Google Search Console, go to Search Traffic > International Targeting and select the country which is the most important to you. You can target the United States but it can be very competitive. You get less competition if you target your own country but you’ll probably get less traffic. 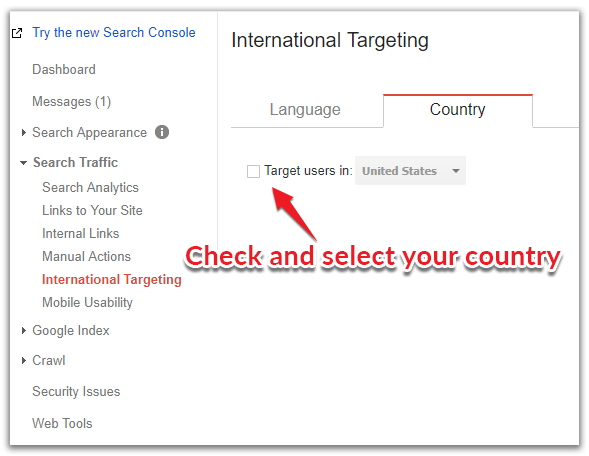 If you want to target a global audience but still want to associate your blog with a particular country, leave the box unchecked. For the third point, if you get more backlinks from your own country, that signals Google to give some importance to you in your own country too. As a non-native English speaker, you have one powerful asset as a blogger. That asset is your own unique voice. There’re no other bloggers like you. You have your own way of explaining things, telling a story and sharing your own unique experience. Use these to make your blog stand out and to better connect with your readers. For example, for this post, my target keyword is “make money blogging”. At the moment, it is almost impossible to compete with anyone in the top 10 in Google search result for that phrase. But I may have a better chance if someone searches for “make money blogging in English”. There are thousands of blogs teaching you how to make money blogging. It’s really getting out of hand. But none of those (at least I haven’t found one yet) that talk comprehensively and specifically on how a non-native English speaker can make money blogging in English. So when you write about a popular topic, think about how you can add value to the existing conversation. What unique perspective you can tackle to make your post stand out? If you want to be memorable, and want people to come back to your blog, avoid writing another “me too” blog post, unless you can write a better post than the existing ones. You can hire someone from as low as USD5 from Fiverr to proofread your blog posts. Just make sure to hire a native English speaker. If you are just starting out, and you don’t have money to pay someone to edit and improve your blog post, you may be thinking of using Google Translate but I advise against it. Start writing your blog post in English and improve upon it continuously. Don’t write in your native language and translate it later to English using Google Translate. It can give you an idea of what the text may be but, you’ll miss a lot of nuances, hidden meanings and sometimes even alter the meaning of the text. Since it’s machine translation, you will end up with many grammatical and punctuation issues. 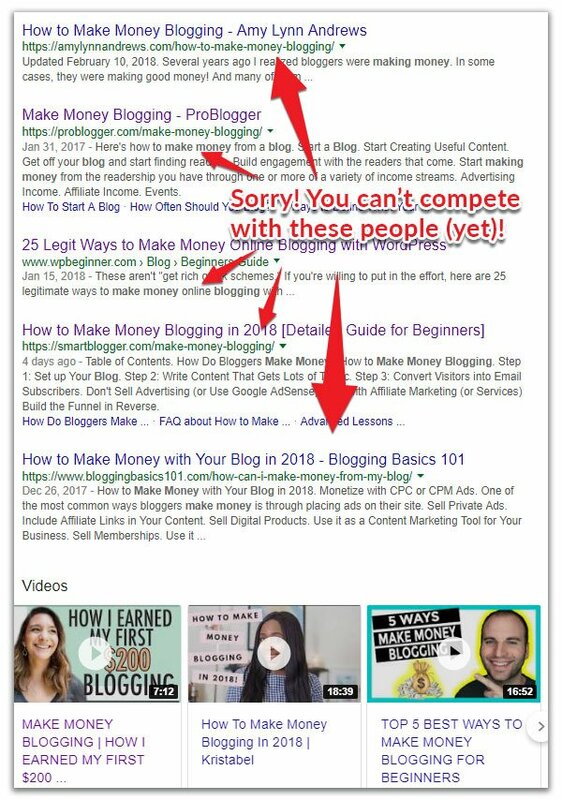 It’s may be enough just to “get by” but if you want to make money from your blog, its poor quality will reflect badly on you as a blogger or your company. Personally, I am using Grammarly to help me fix and improve my English blog posts. 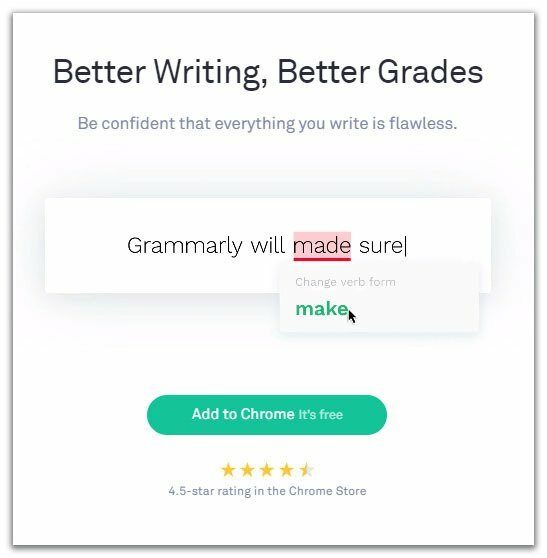 Grammarly checks your text for many common and advanced writing issues including common grammatical errors and spelling mistakes. It also provides synonym suggestions to make your writing more readable and precise. It won’t help you write like a native English-speaker but it’s good enough in detecting the obvious mistakes you would otherwise miss. I’ve tried both the paid and free version and find both very helpful. You can add the Chrome plugin or Microsoft Word plugin (this is what I’m using) to automatically check as you type. Check out how Grammarly can help you improve your English text. Blogging in English or any foreign language for that matter is not easy but it can be done. You just need the right idea, basic grammar skills, a unique voice and a good writing style. You need to understand your audience. Write about topics that solve their problem. Try to include reference to your own context to connect with them closer. You don’t have to be an expert in your niche. An honest and open view of your own blogging journey, for example, can be just as interesting and informative as those of an expert. 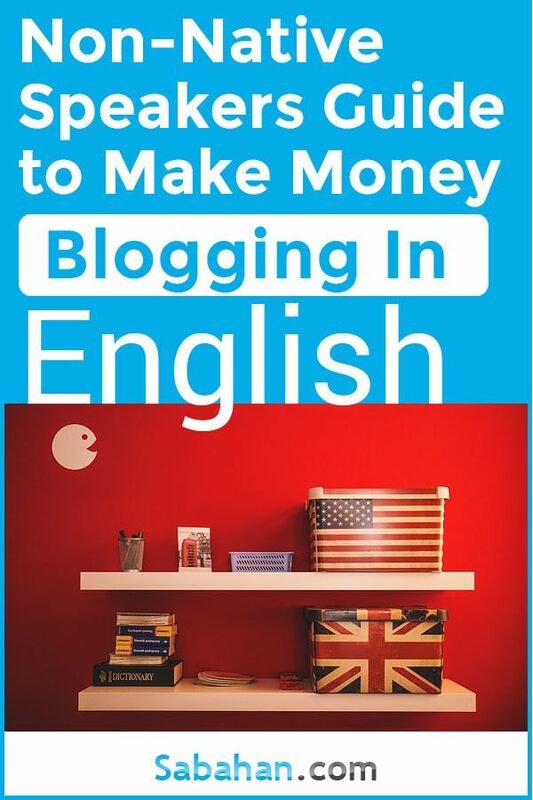 Many other bloggers whose English are not their first language are making good money blogging online. If you stick to the tips outlined in this article, even expand them, you’ll be on you way to creating a good English blog. Please leave a comment or share this post if you find it helpful. Thanks for reading! Thanks for the comment qman. I am at this point, after reading this article with handy guidelines. Just nice Victor. And, thank you. Glad you find the article helpful Hasan. Thanks for stopping by! My friend Anil is a shining example Gaman. He writes clear, concise English but it is not perfect. Yet he succeeds. I see value he shares and promote his stuff freely. No need to be 100% perfect writing English guys; just practice writing, get clearer, help folks, make friends and you will succeed. Pinned and Tweeted. Hey Ryan, I agree blogging is a process and we don’t have to get it perfect the first time. In fact, practice makes perfect! Most importantly, provide value! Thanks for the pinned and tweet! Glad to know you find the article useful Martin.